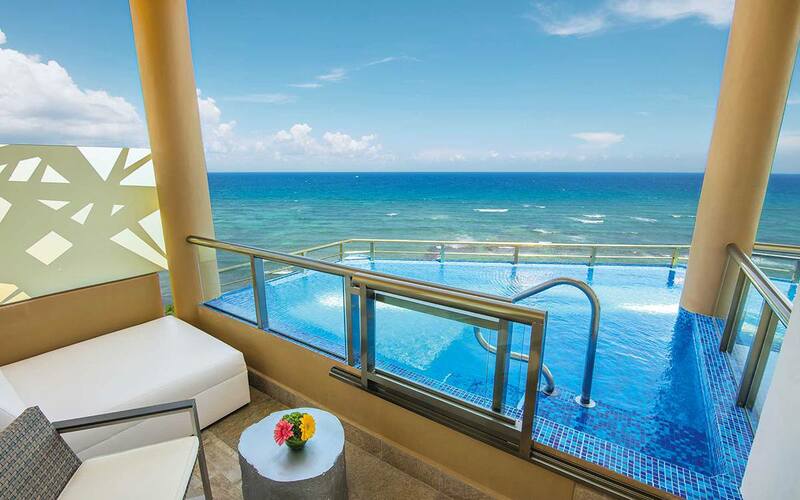 Enjoy the best views from your balcony infinity pool. The Oceanfront Swim Up Relaxing Hot Tub Suite offers classic sophistication and elegance with all of the modern amenities – including a balcony infinity pool where you can cool down while enjoying the best views of the Caribbean. Rest easy in the king-sized or double beds, unwind in the living area with a sofa, relax in the indoor Relaxing Hot Tub, and pamper yourself in the spacious bathroom with double sink and glass enclosed showers. 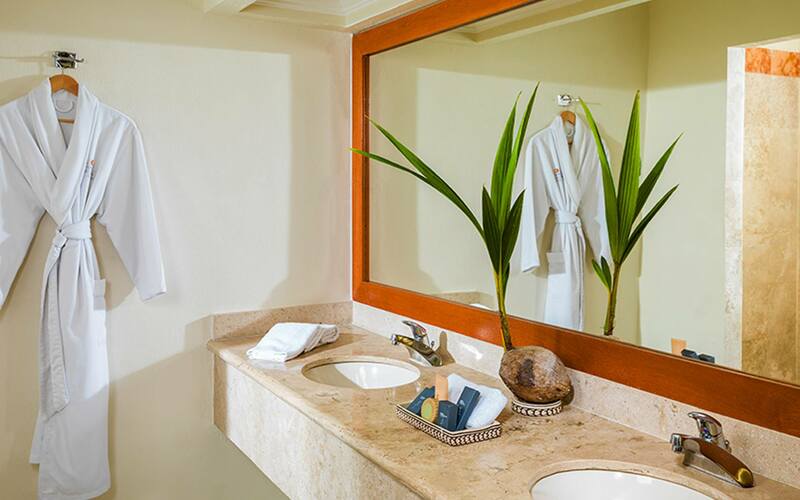 Every suite also comes with an oversized closet. 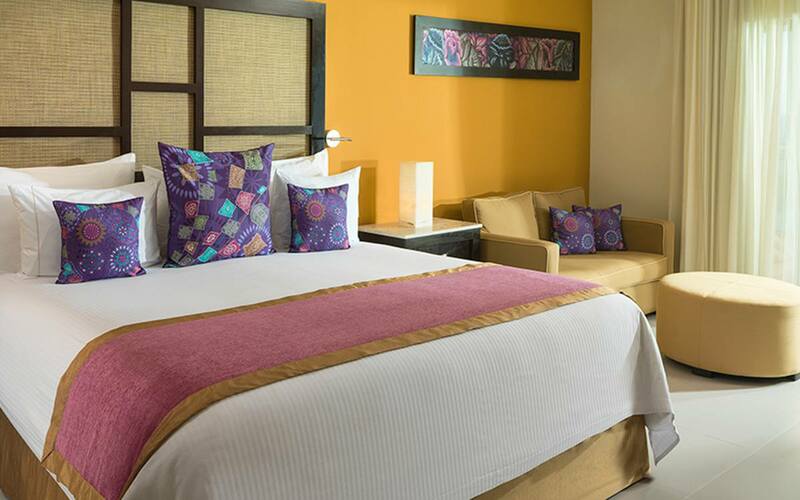 Book Now and Save 40% Per Night. 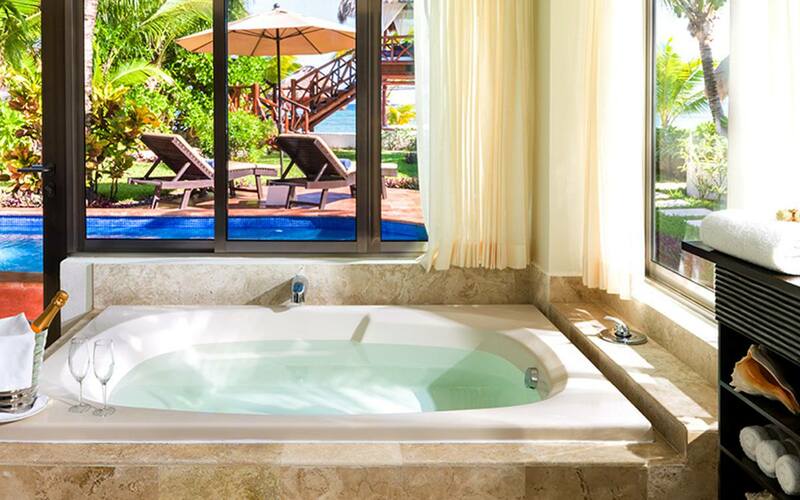 The Oceanfront Pool Swim-Up Relaxing Hot Tub Suite offers the ultimate in style, luxury and comfort. 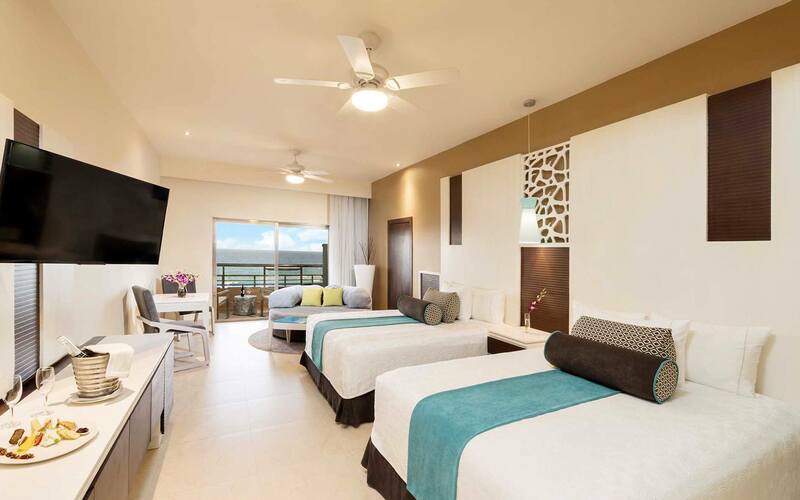 Enjoy a master bedroom with a king size or double beds, a spacious living area with a sofa, and large Smart TV, a relaxing indoor Relaxing Hot Tub, large bathroom with double sink and glass enclosed showers, oversized closet, and swim-up access connecting you to the main pool and bar. 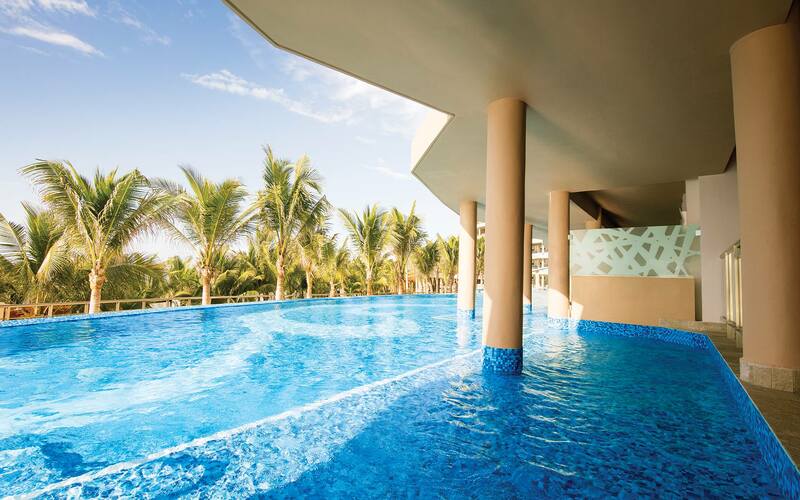 Located on the highest floors with balcony infinity pools, with a king-size bed and the best views available, with additional benefits included. 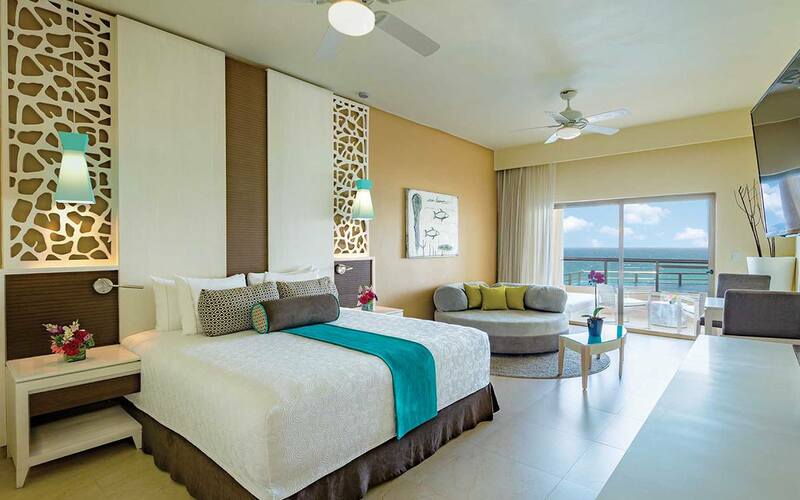 This suite features a separate living-room area with striking views of the surrounding nature. 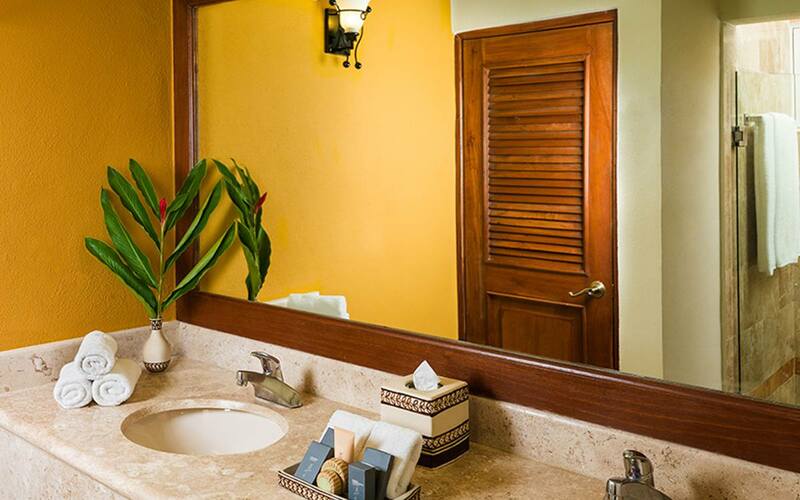 These charming suites feature king-size bed, a separate living room area, and of course a Relaxing Hot Tub to relax in warm bliss at any time of the day or night. 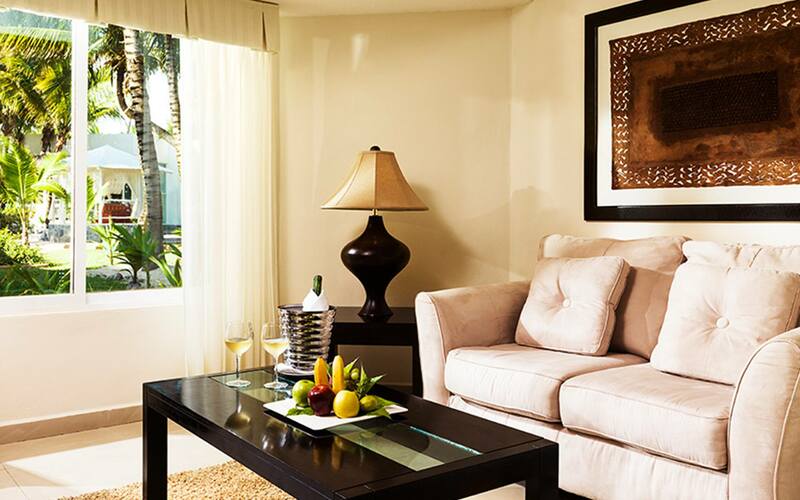 Paired with classic décor and contemporary touches of design, these suites exude pure romance and relaxation. 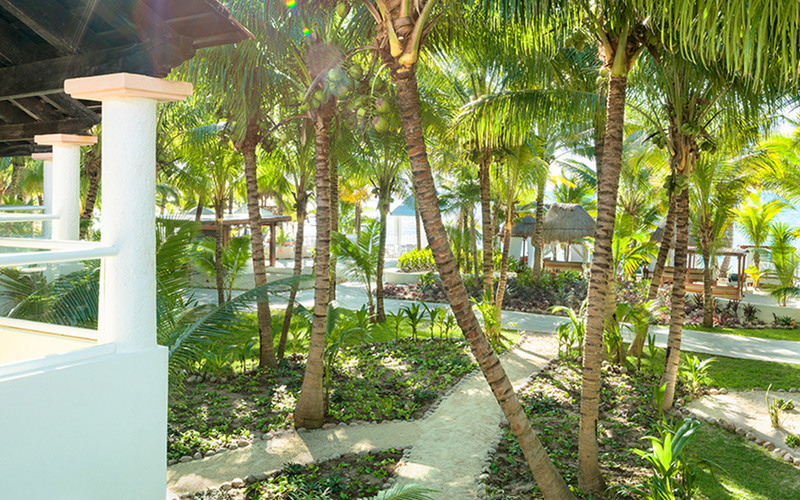 Located in the midst of the resort’s luxurious gardens, only a few steps from the beach. 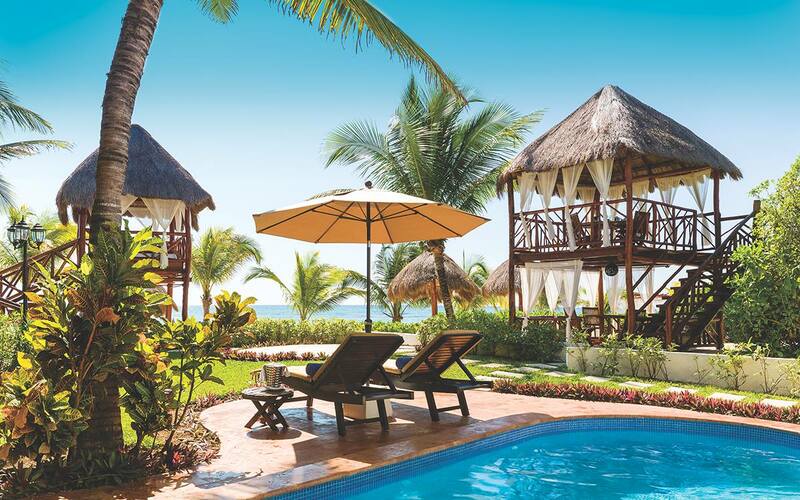 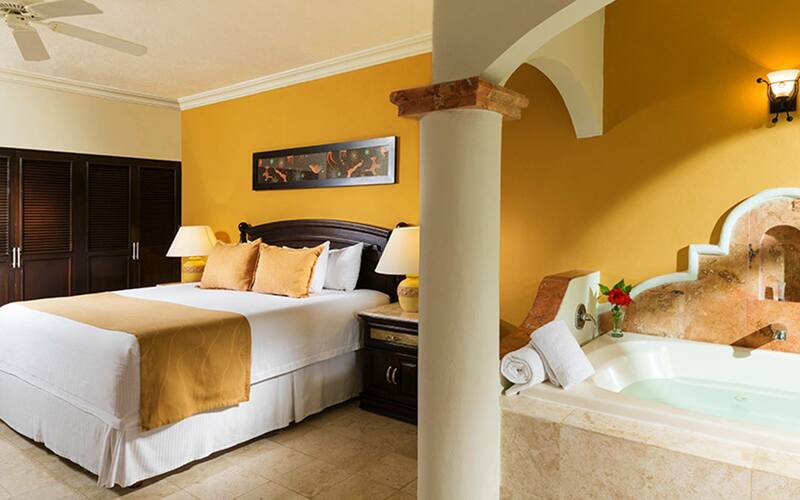 These Beachfront Relaxing Hot Tub Suites offer the best of both worlds – a view of the magnificent Riviera Maya coastline, and a Relaxing Hot Tub to relax and reflect upon a day well spent exploring what’s just within view. 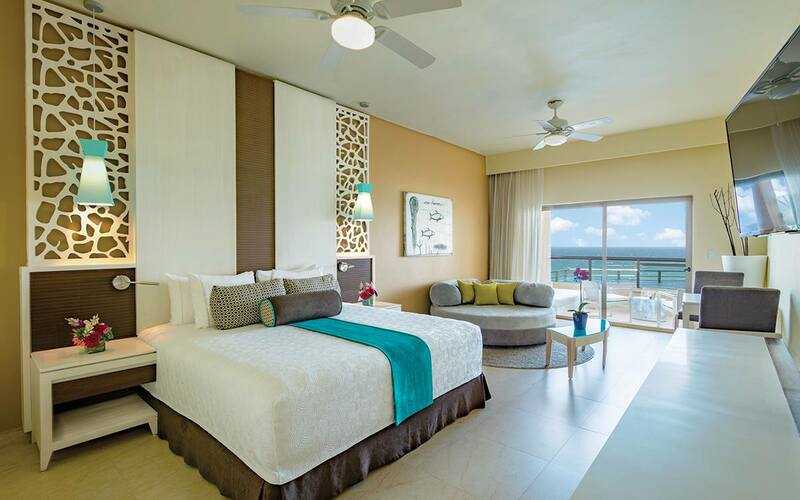 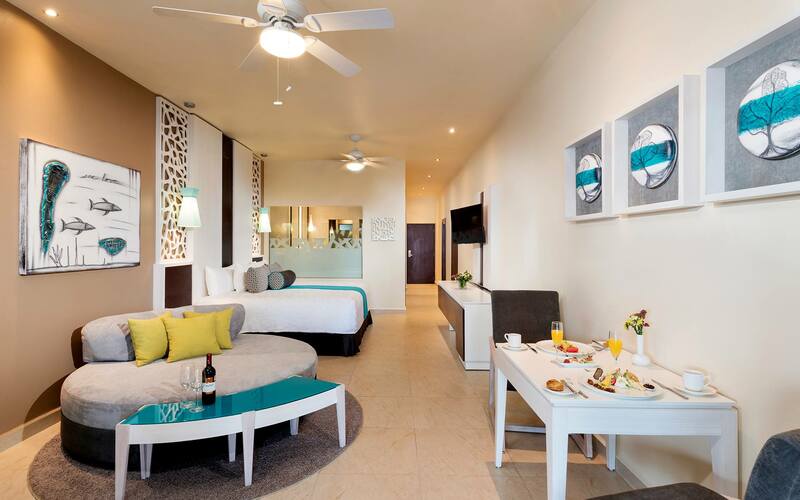 All of these suites feature king-sized beds and are only steps away from the inviting blue waves. 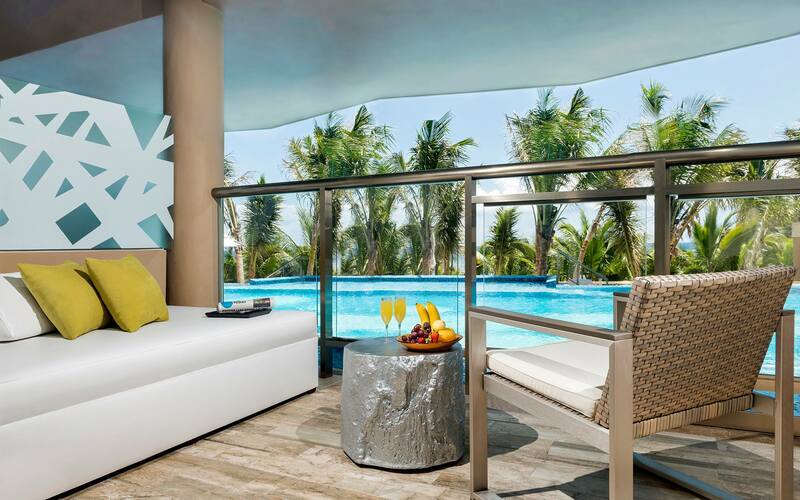 Enjoy direct access to the lazy river and scenic views from your own private furnished terrace. Experience comfort and luxury all in one elegant suite. 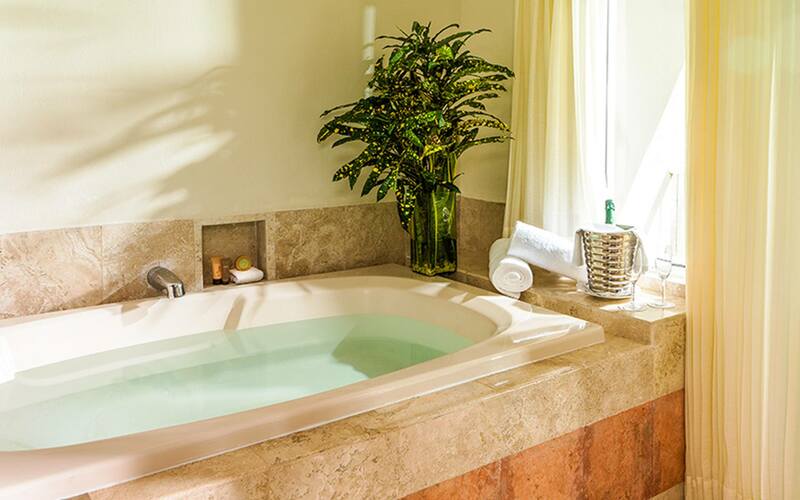 The Swim Up Relaxing Hot Tub Junior Suites feature direct access to a lazy river that flows just beyond the suite’s terrace. 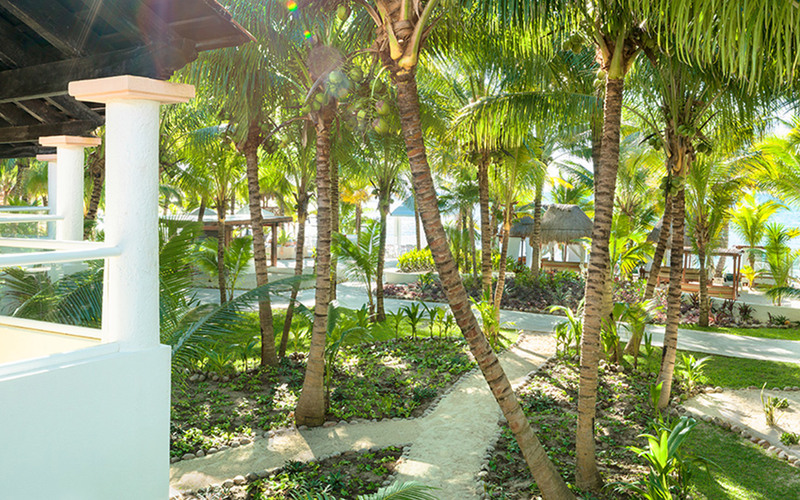 Enjoy nature’s vibrant colors of the gardens that surround these suites, as well quick access to the pool and swim up bar. 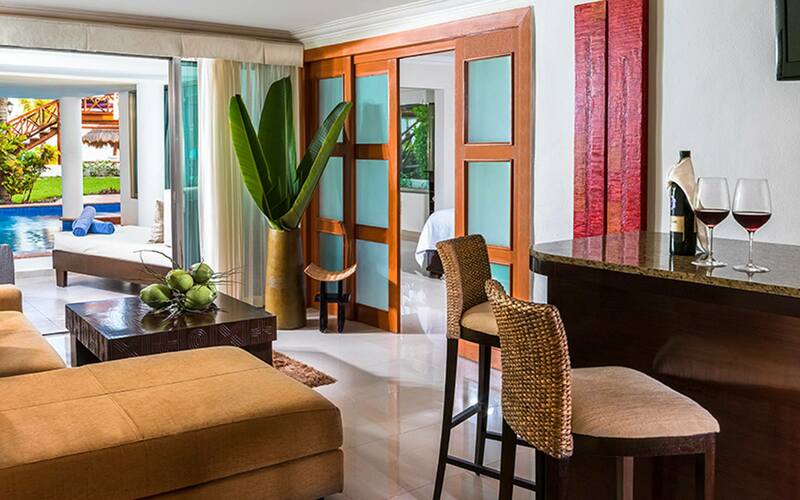 THESE MODERN SUITES FEATURE A BEAUTIFUL VIEW OF EITHER THE LUSH GARDENS OR POOL. 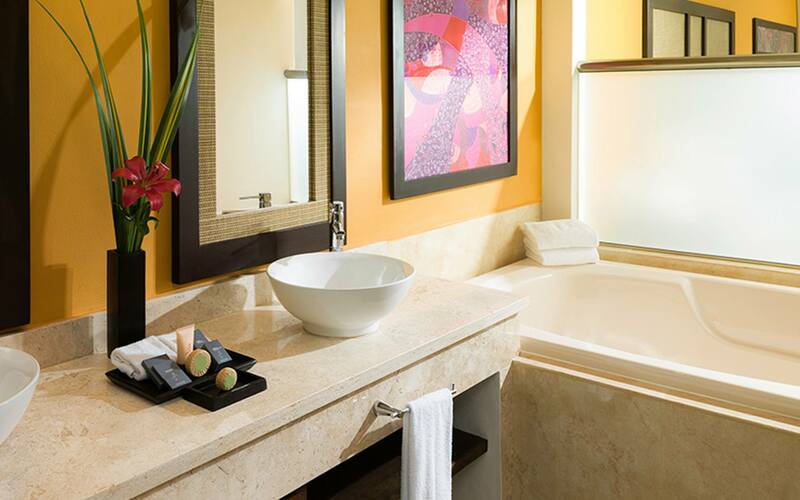 Located in the Palms section, the Premium Relaxing Hot Tub Junior Suites are a breath of fresh air. 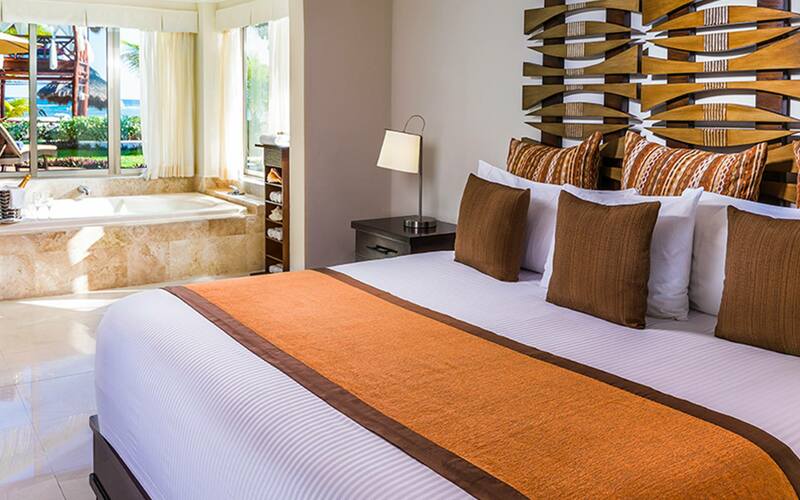 With plush bedding, a cozy sitting area, spacious design, fine toiletries, and a lavish Relaxing Hot Tub, these suites offer a chance to indulge in pristine elegance. 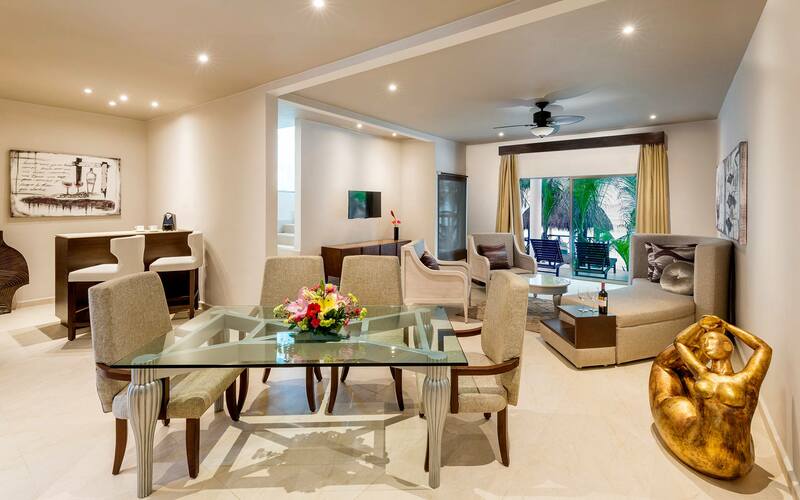 Enjoy intimate time from the separate living area of your Royal Suite. 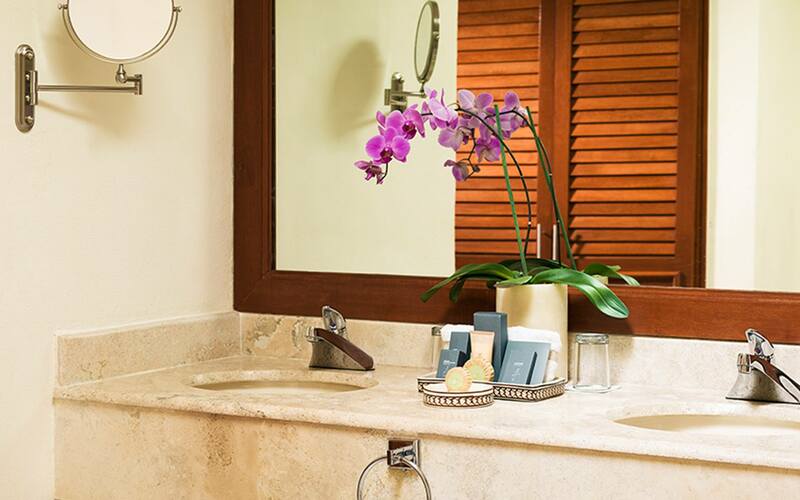 The Royal Suite offers romance and intimacy, along with many comforts and amenities. 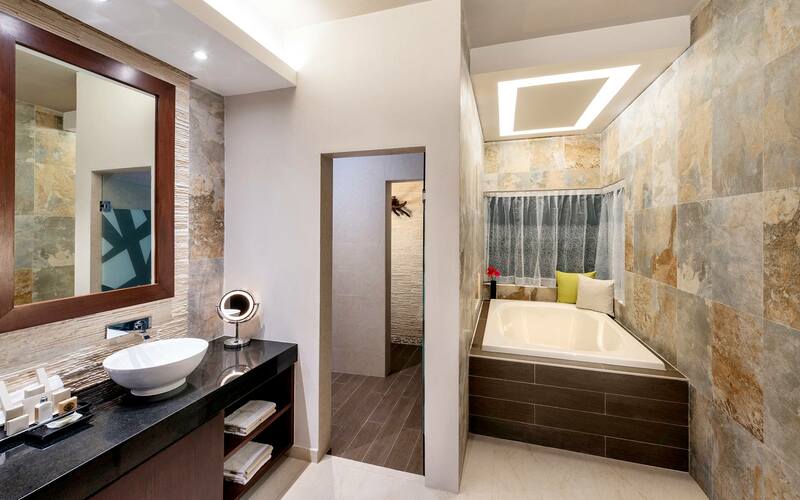 Featuring a separate living area, liquor cabinet, walk-in shower, double sinks in the spacious bathroom and an oversized terrace or balcony. 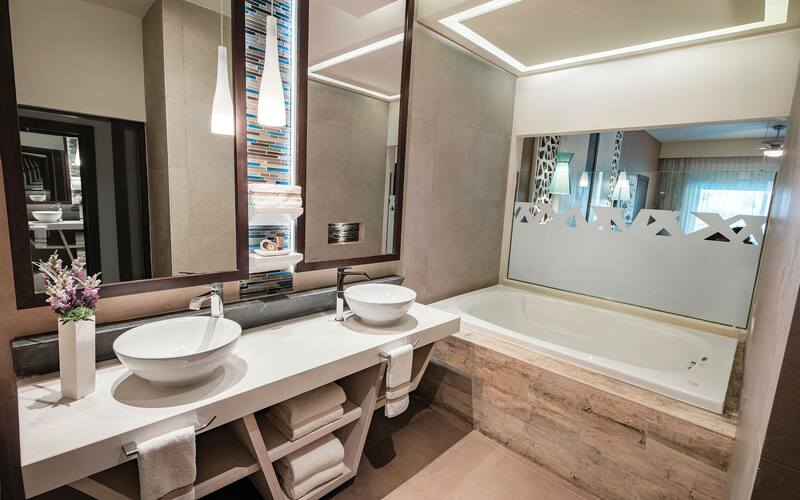 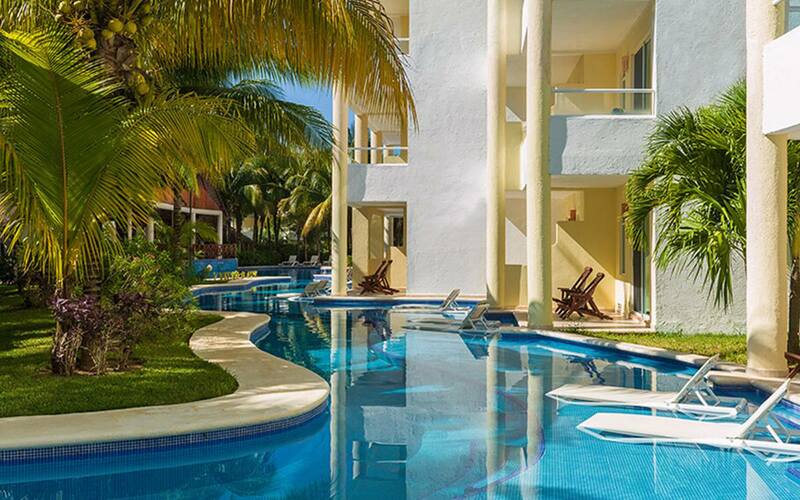 Step right into a lazy river or a pool that flows in front of your suite. 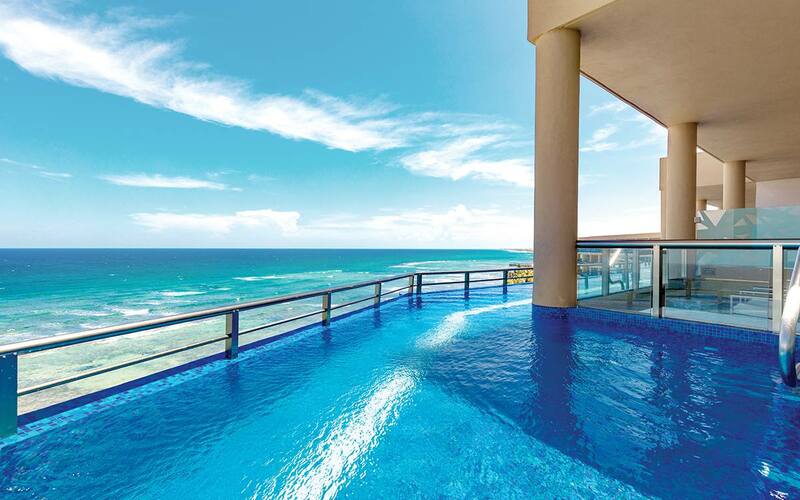 Guests can step right into a pool from the Royal Swim-Up Suite's glass sliding doors. 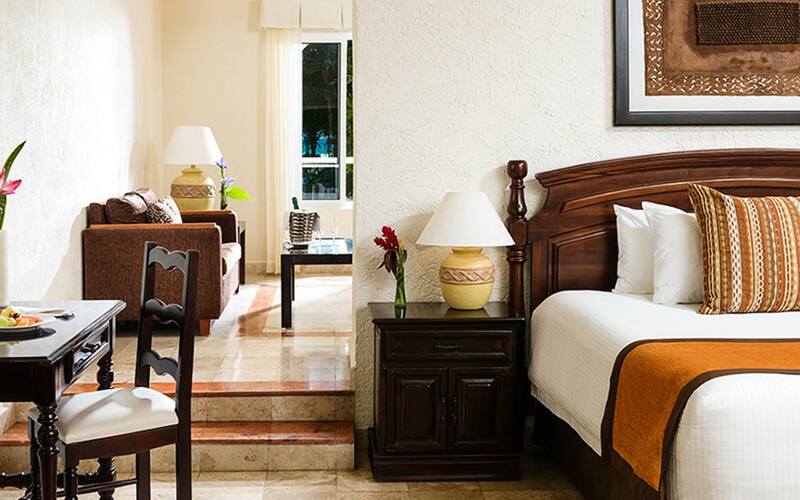 Enjoy the romance and intimacy of the suite's big terrace, a day bed, and all the incredible luxuries of the suite. The suite features a master bedroom, separate living room, and custom pillow menu – among other luxuries. 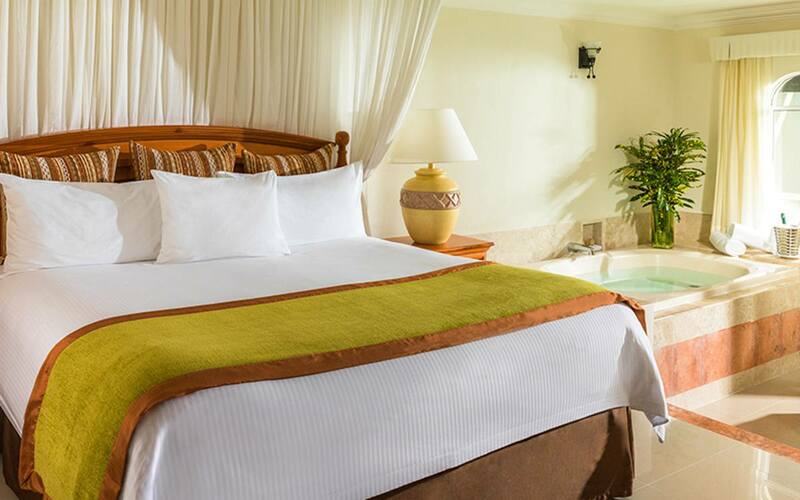 The romantically designed Presidential studio features a master bedroom, living room with plasma screen, DVD/CD player, DVD menu, in-suite ocean view Relaxing Hot Tub for two, toiletry amenities and pillow menu, premium aromatherapy menu, bathrobes and slippers, turn down service every night, safety deposit box, telephone, daily stocked minibar, coffee and espresso maker, iPod docking station, 24 hours room service with premium menu, bottle of sparkling wine and fruit basket upon arrival, cabinet with premium liquor in the room, and complimentary Wi-Fi. 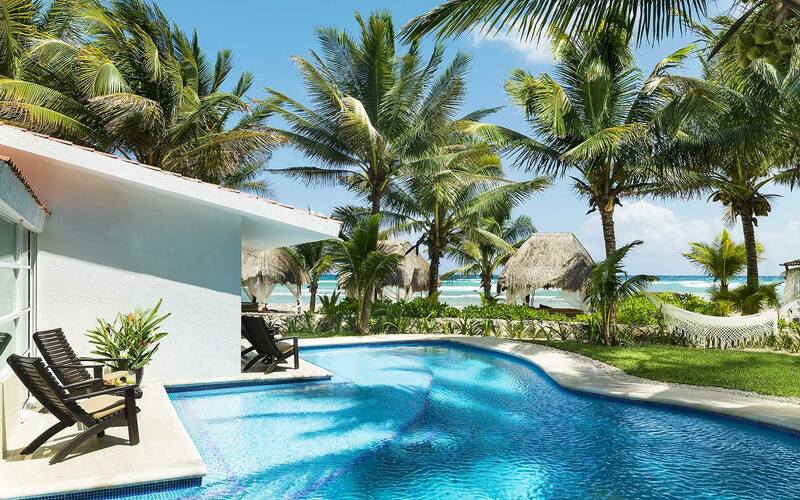 Enjoy the large front patio with either your own private swimming pool or infinity pool and also the designated beach area with chaise lounges, private beach beds, and an ocean view Palapa dining area. 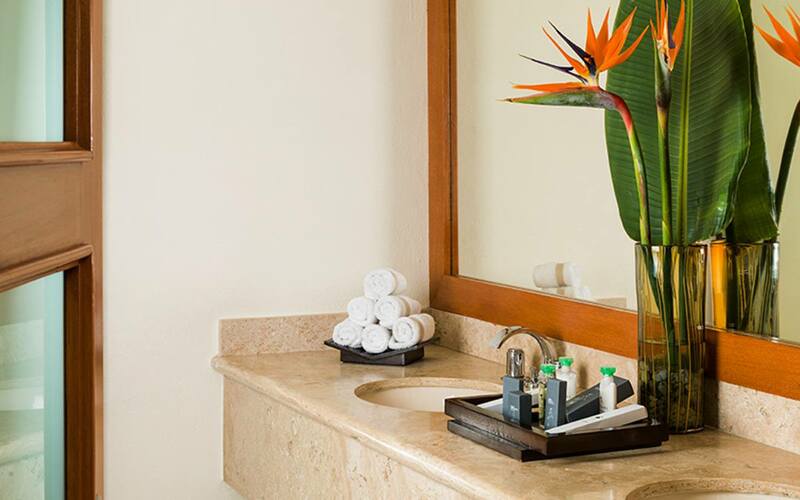 To keep you pampered with Presidential treatment throughout your stay, your personalized butler will be able to arrange for you the following services: DVD console with available movie library at your Butler station, unpacking service upon request, preferred access to all the restaurants. 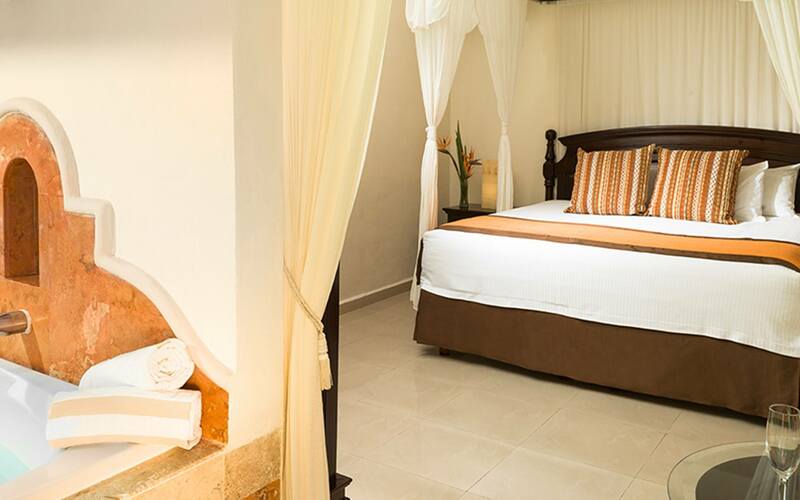 *One couples 25 min massage at the Náay SPA (*min 4 nights stay). 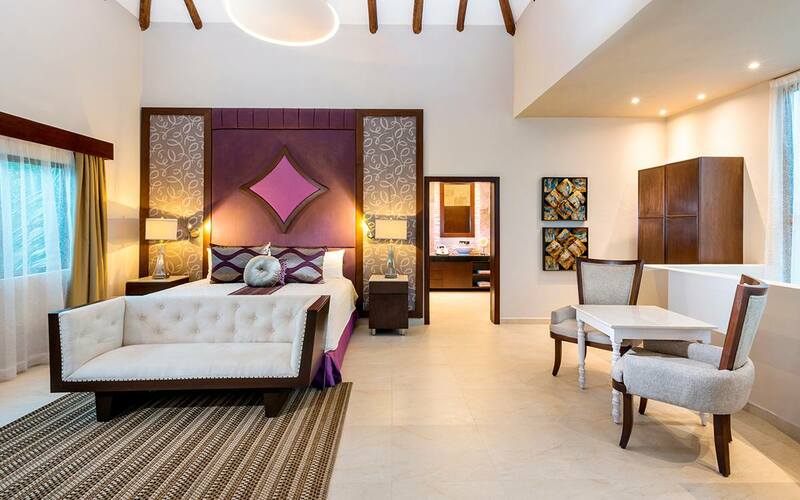 These sumptuous two-floor villas feature elegant interiors and your own private pool – the ultimate experience in luxury and comfort.